How we eat can really affect our health. I found this article on foodproductdesign.com that discusses one of the affects of a high calorie high fat diet. Read the excerpt below, to read the full article Click Here. Women who consume high-calorie diets or diets high in saturated fats have an increased risk for urinary incontinence, according to a new study published in the American Journal of Epidemiology. Researchers examined intakes of total energy, carbohydrate, protein and fats in relation to UI in a cross-sectional sample of 2,060 women in the population-based Boston Area Community Health Survey (2002–2005). Data were collected from in-person home interviews and food frequency questionnaires. Logistic regression was used to calculate odds ratios and 95 percent confidence intervals for the presence of moderate-to-severe UI; a severity index was analyzed in secondary analysis of 597 women with urine leakage. Greater total energy intake was associated with UI and increased severity. No associations were observed with intake of carbohydrates, protein, or total fat. However, the ratio of saturated fat intake to polyunsaturated fat intake was positively associated with UI and was strongly associated with severity. For the best in Home Care in the Allentown, PA area visit our website at http://www.family-caregivers.com/. I found this interesting article on TheNewOldAge.com and found it interesting. Here is an excerpt below, to read the full article Click Here. The population of older Americans is growing faster than ever and living longer than ever, but not as long as in much of Europe and elsewhere in the developed world, according to “Older Americans 2010: Key Indicators of Well-Being,” a report compiled by 15 federal agencies. The full report, with tables detailing senior demographics, economics, health status, health risks and health care, is available at agingstats.gov. It contains a number of surprises, and raises a number of questions, for those interested in how Americans are aging. Americans who live to age 65 can now expect to survive on average 18.5 more years, four years more than in 1960, according to the report. Of those who survive to age 85, women have an average 6.8 years to live, and men, 5.7 years. But life expectancy is even longer in most of Europe, Australia, New Zealand, Japan, Singapore, Hong Kong, Cuba and Costa Rica. The 85-and-over United States population, the fastest-growing cohort in the country, is projected to rise from 5.8 million today to 19 million in 2050. Living longer does not come cheaply. After adjustment for inflation, annual health care costs for the average senior increased from $9,224 in 1992 to $15,081 in 2006, the report says. Heart disease remains the leading killer of people over 65, but now patients die of the disease at only half the rate (1,297 deaths per 100,000 people) they did in 1981. Cancer, strokes, lower respiratory diseases and Alzheimer’s disease were the other top killers. The reported rate of death from Alzheimer’s rose almost thirtyfold, from 6 per 100,000 in 1981 to 176.9 per 100,000 in 2006. Officials said the increase mostly reflected improvements in diagnosis and reporting in the 1980s. ...continue reading at The New Old Age by Clicking Here. I found this article on ways to help you take good care of your skin as you age. Read the excerpt below, and the full article here: http://www.senioradvice.com/inner.php?aid=273. Skin changes with age, becoming thinner and appearing different than it used to. Damage to skin may take longer to heal, and areas of skin exposed to lots of sunlight can become wrinkled, dry, or even cancerous. Depending on the issue, there are many ways to treat problems with aging skin. Dry skin can lead to itching, bleeding, and infection. It can also contribute to sleep problems. Such problems can be treated by medication, so it is encouraged that one seek medical attention before itchy skin leads to more serious conditions. Men and women can also use lotions and ointments, take fewer baths, use milder soap, use cooler water when bathing, or use a humidifier in order to treat dry and irritable skin. With age, men and women can bruise more easily and take longer to recover from bruising. Senior citizens with excessive bruising should see a doctor. Over time, ultraviolet rays and gravity can cause the skin to become less elastic and subsequently sag and wrinkle. Other habits like frowning and smoking can cause the smile to wrinkle. There are many ways to treat wrinkles but seeking medical advice before using these treatments are highly recommended. Age spots, which are sometimes referred to as "liver spots" are brown spots that can appear on the body. They are harmless signs of years of sun exposure. Women especially can also experience "skin tags" or flesh-colored growths of skin. Although these age spots and skin tags are harmless and are simply due to aging, it is important to alert your doctor as it may be difficult for those without medical training to discern between these and irregular growths. A dermatologist can remove both of these types of growths if they are bothersome. Wandering, moving about without a definite purpose in mind. Have you ever done it? Most of us have wandered at one time or another. On the spur of the moment you go for a walk without any specific plan. You walk to the park, or walk into town, or to a best friend's home without really planning it out first. You can get there safely and return to your home without difficulty. But what if that person wandering was an individual with cognitive deficits such as Dementia or Alzheimer's disease? In most cases they would not be able to find their way home. They may know where they are planning to go; such as a familiar place they often visited such as work, a neighbor's home, or taking their pet for a walk. But once they begin their journey these individuals become disoriented and can not figure out where they are or how to get back. This kind of wandering in individuals with cognitive deficits is dangerous. I am attaching a link for you to listen to a Web Cast on Alzheimer's patients and wandering. It is an excellent educational audio that was sent to me which discusses the causes of wandering and what you can do to make the person safer. Click on HealthTalk to listen to the web cast audio. For additional information on Alzheimer's disease and how to ensure the safe living of your loved one contact Family Caregivers Network or email me at gfioriglio@family-caregivers.com. Thank you for listening. TWO years ago my father, then 83, became very ill. Until then, he had been living alone in a pleasant one-bedroom apartment on the Hudson River, an hour’s drive from my home in Brooklyn. After a couple of months in the hospital it became clear that my dad, Harvey Alderman, could not return to solo living. He was fragile and forgetful, and there was no way he could keep track of the 14 or so pills he had to take each day. But where would he go — and how would we pay for it? Could he stay in his apartment if he had regular visits from an aide? Or should he go to an assisted-living facility where there would be more services available for him? So began my family’s crash course in caring for an aging parent in declining health. If you’re in this predicament, you know already there is no simple answer. Older people each have unique medical and emotional needs. And finances often dictate how far you can go in creating the ideal situation for them. That is what Linda Chase, a lawyer in Reston, Va., realized after running the numbers on what it would cost for home care for her mother, who has dementia and needs round-the-clock attention. “We couldn’t afford private home-health care, so the only option for us was assisted living in a facility with dementia care,” Ms. Chase said. Below, I offer guidelines and considerations that can help you make an informed — if not always easy — decision about what type of housing will support your parent’s needs, without bankrupting the family in the process. For more assistance with an aging loved one in your life visit our website at http://www.family-caregivers.com/. Caregiver Support Groups, can they really help the Caregiver? Thank you for visiting our blog and reading our posts. 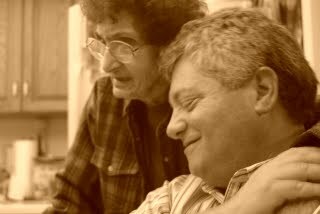 The last post was an article written by Byron Pulsifer about how to take care of the caregiver. At Family Caregivers Network we hold monthly caregiver support groups for anyone who is a caregiver. Whether you provide direct care or are indirectly involved in the care of someone you are a caregiver. Often caregivers are intimidated by support groups. They are afraid to share their story. Many caregivers believe they are managing their role and don't need to discuss their situation with other caregivers. Yet when they attend a meeting caregivers find they identify with the stories of other caregivers. At Family Caregivers we believe that by sharing your story you can help others as well as yourself. You just need to let down your guard. This is easier for women than for men. Men don't easily share their emotions which can cause them to have "caregiver burnout" at a much higher rate than women. In the past 10 years of facilitating caregiver support groups only a handful of men have attended our groups. Yet those who have attended our support groups found the support and fellowship needed to be a stronger caregiver. To learn more about caregiver support groups and how to take care of the caregiver tune in to PCTV "What's Happening" online Thursday, August 5th at 12:00 pm. Go to website, http://www.deneliott.com/ and click on the video for "What's Happening" Live call in questions will be taken during the show. You can also view the show on Pottstown Comcast Cable Channel 28 or 22. Join us, I look forward to your comments. I can be reached at gfioriglio@family-caregivers.com anytime for questions about caregiving. So many emotions and so many thoughts of being helpless come to our mind. If you know of someone who is dying, or who is seriously ill, our hearts always seem to rest squarely on that person. For those who are concerned about this seriously ill or dying person, we usually want to help, but can't. We are not miracle workers; we are not able to heal them no matter what we may think of doing or wanting to do. But, in all our concern shown towards this person there may be someone else who desperately needs our help but seems to be far away in the shadows of our minds. The person, who we can help, however, is the care giver especially if this person is the primary person extending at home care. Day in and day out, they are constantly vicariously living with their loved ones pain and anguish. The ups and downs that seem to come and go as if in a blur are there continuously. There is no way to escape the pain, the sorrow, the incessant question of being able to cope after their loved one has died. So, what can you do? Frequently, the care giver needs to know there is someone there who they can talk to, to confide their inner emotions, their own anguish, and their feelings of deeper and deeper entrapment in a spiraling course of disease that they cannot alter. The endless trips to the doctor, medical tests that seem to be repeated endlessly, the attempts to control pain or the progression of the disease, or the 24/7 knowledge that their life will be forever changed with the death of their loved one, is their constant diet. If you are unable to visit because of distance, you can call the care giver on the phone every week. Of course, you'll want to know how their loved one is, but you also want to know how the care giver is coping. This is the time when you want to develop your listening skills. Often, a good listener is more valuable than a great conversationalist. You want the care giver to feel free, to open up, and to spill their emotions out to you. And, your role is not to offer trite "I know they will get better soon' meaningless phrases.